Poisoning – taking in toxins from eating, drinking, breathing, or absorbing them – is a serious problem that hurts lots of people and their families in South Florida every year. Poisonings in South Florida sometimes cause severe injury; sometimes people die from accidental poisonings. 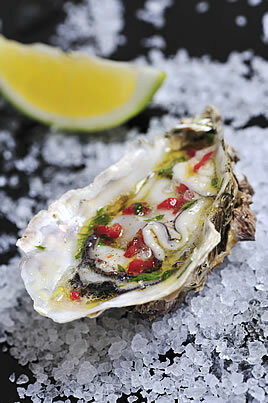 For Miami-Dade County, accidental poisoning is a serious issue. Poisoning death totals have been consistently rising in the United States for the past several years, while other forms of injury fatalities have been falling. Not only is poisoning overall as a cause of death on the rise, fatal drug poisoning has significantly increased. On average, poison centers handle one poison exposure every 14 seconds. Over two million poison exposures were reported to local poison centers in 2000. Most poisonings involve everyday household items such as cleaning supplies, medicines, cosmetics and personal care items. 89 percent of all poison exposures occur in the home. 92 percent of exposures involve only one poisonous substance. 86.7 percent of poison exposures are unintentional. 75 percent of poison exposures involve ingestion of a poisonous substance. Other causes include breathing in poison gas, getting foreign substances in the eyes or on the skin, and bites and stings. 77 percent of all exposures are treated on the site where they occurred, generally the patient’s home with phone advice and assistance from local poison control experts. Unintentional and intentional exposures continue to be a significant cause of morbidity and mortality in the US. The categories of substance exposures increasing most rapidly are: analgesics, followed by sedative/hypnotics/antipsychotics, cardiovascular drugs, antihistamines. Poisonings are the leading cause of injury-related deaths and hospitalizations among Florida residents ages 25 to 54 years old. Poisonings were also the leading cause of injury death overall, surpassing motor vehicle traffic crashes by 848 deaths. Fatal unintentional poisoning by prescription drugs is a growing public health concern. In 2009, 3,334 Florida residents died from poisoning. 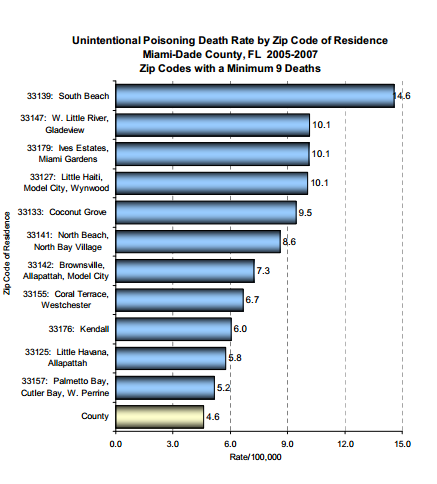 There were an additional 19,704 hospitalizations in Florida for non-fatal poisonings. The poisoning fatality rate among males was nearly two times higher than among females. The non-fatal poisoning hospitalization rates were similar among both sexes in all age groups. Females had a slightly higher hospitalization rate than males for poisoning. Residents ages 25-54 had the highest poisoning fatality and hospitalization rates. 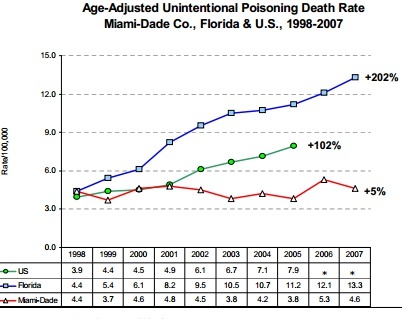 According to the Miami Dade County Health Department between 1998-2007, the unintentional poisoning death rate for Miami-Dade residents has remained about the same, while that same death by poisoning rate has exploded 202% over the State of Florida as a whole over the same decade. Residents of 33139 (South Beach) had the highest UP rate (14.6/100,000), more than 3-times higher than the county rate of 4.6/100,000.